Then, as I sat in the grotto, a feeling of pure and unadulterated peace overtook my body. I felt giddy with excitement although I had no frame of reference as to the reason. Every one of my senses became more attuned. I felt the cool stone beneath my little hands; its hard smooth surface under my thighs and buttocks. I smelled the sweet aroma of lilacs that graced the perimeter of the yard. I didn’t dare move for fear this state of being would pass. I heard sparrows above my head shifting on the branches of the apple tree behind me and took notice as they sang their morning songs to the world. And then, among this symphony of sound, I heard her voice. It was gentle, yet strong. She said, “Anna, I am here for you always. Always come to me.” A total unconditional love overtook me; there was a feeling that was and remains so extraordinary and so difficult to describe in words. People always say this—I know—but it is very true: Our language is too limited to convey spiritual feelings or to describe the wondrous feeling of Mary’s presence. I couldn’t move. I didn’t want to move for fear that this sensation would leave. And then suddenly, there she was, directly in front of me. Mary was smiling at me; her hands reached for me. I didn’t reach out; I was stunned. I felt paralyzed. I knew without a doubt that this was Mary, although she didn’t look like the renderings I had seen of her in books or even in churches. She was dressed in a well-worn brown robe; the fabric appeared rough, but radiated warmth. There was a light brown dress underneath. She had olive skin, wide, soft mahogany-colored eyes and coffee colored hair that hung to her waist where a hemp belt was tied and held her dress together. She wore a tan colored covering adorning the top of her head, but no hood. Her face stood out in repose. Her penetrating eyes captured my attention and communicated with me in a way that I can only describe as speaking to my heart. I didn’t just hear her words; they became mingled with my very essence—my soul. I didn’t want this rapture to end. I remember just sitting there for what seemed like hours, catatonic, as I basked in the overwhelming love of this beautiful vision. Later, I would tell my playmates of the Lady in the grotto and we would make a game of talking to her and asking her to make our dreams come true. We were children and open to all of the miracles that God put before us. The feeling of that first time still lingers and makes my heart skip a beat. And that, I believe, is what perfect love does to us all. I know what real love is. Mary showed me. I sat for a while in the grotto. It was as though she had swaddled me in a cozy blanket of warm love. When I finally reentered the house, the sun was still kissing the mimosa tree by the back door, its pink flowers rising up to embrace the warmth of the rays. Everything seemed quieter; the birds chirped softly. The music that was coming from the house was muted; Vikki Carr was replaced by the mellifluous crooning of Dean Martin. I climbed the steps to the back door and saw my mother directly in front of me, seated at our dark brown kitchen table. She was drinking a cup of coffee and slowly inhaling a cigarette. My mother was young then, around twenty-six. I remember she wore white pedal pushers. The house smelled of Pledge and bleach and the pungent aroma of coffee; a haze of cigarette smoke lingered and left a stale peppery odor. I walked over to the chair opposite her and sat down, my feet dangling. I asked her if she had ever seen or spoken to Mary. Without looking up she took a drag off her cigarette and turned a page in her magazine. “Mary who?” she asked. “Mary, the lady in church,” I gingerly answered. My mother lifted her head. Her eyes met mine. A long silence passed before she rested her cigarette in the ashtray and told me, as matter-of-factly as she could, that she wanted to know what this was all about. And so I told her what I had seen, that Mary had talked to me. She wasn’t nearly as shocked or dismissive as I would imagine another adult might be. You must understand that my mother was a believer long before me. Both my parents were deeply religious. She gently expressed that she believed some people were truly gifted and that if I saw Mary, then I should continue to pray and believe. My confession turned out to be a joyous occasion for my family. When my father learned of our conversation, he mirrored my mother’s sentiments. In retrospect, I realize that this was the perfect way for Mary to introduce herself to me and at the most ideal time in my life. I was simply a child, not yet marred by convention or the judgment of others. I led with my heart and was in tune with my soul. I felt the power of God in nature but was too young to give voice to it. Mary alleviated all my fear and her love washed over me and held me still. There was something about her beauty, serenity, and love that filled me with immediate faith. In my innocence, I had no reason to question why she was coming to me or how this was possible. All I can say is that the experience was profound. While I now hear her and sense her in all that I do, I have never actually seen her in that way again. I try not to question why and I understand now, after years of hoping to see her again, that I don’t really need to see her with my eyes. Feeling her presence around me and within me, really connecting to her essence, is far more important. What she looks like doesn’t matter; it is what she says and how she makes me feel that is far more significant. Decades later, on a bitter freezing day in the winter of 1989, I left the building where I worked, bundled in a puffy coat zipped up to my chin, my eyes peering out from a tight ski hat. It was the lunch hour. I was in my late twenties and felt as though my life was going nowhere. I was married and yearned to have a child, yet couldn’t conceive; my job was not fulfilling and I felt that I was just robotically going through the motions of life without passion. I was disillusioned with life and becoming depressed. At the time, I was working on Madison Avenue. I detested my job and it added to my feelings of being lost and empty. I felt stuck on a path that I didn’t want to be traveling on. In fact, I felt as though someone had put their grimy hand into a crevice of my chest and yanked out my slow beating heart. I was becoming part of the “rat race” and was, on an emotional and soul level, rebelling. The business world was more than I could handle. It was aggressive and uncaring. None of it was working for me. As I turned to walk, the wind viciously slapped my cheeks, bringing tears to my eyes. Madison Avenue was crowded with people walking briskly, everyone rushing from one place to another, everyone with a purpose. I felt as if I was pushing and shoving my way down the street. This was my life. I felt achy, uncomfortable physically and emotionally. I didn’t know where to go to feel alive again. And then, in that maze of people, between the blare of a siren, the heavy wail of a city bus, and the tap of a spatula from a nearby food cart, I heard a gentle whisper; I felt a calming presence—it told me to go to Mary. I didn’t pause to think, my feet seemed to move of their own volition and I headed south to St. Patrick’s Cathedral. As I entered the cathedral the pungent aroma of incense welcomed me. The flickering orange and yellow glow of candles lit the darkened church as people milled around, some praying and some just taking in the magnificence of the structure itself. I headed back to the Lady Chapel. As I approached the small sanctuary, I dug into my purse for change to light a candle. The quiet was almost surreal compared to the blaring city that was just outside. I flinched as the coins rattled when I dropped them into the tin collection box. Their sound resonated. I lit a small pearl-colored prayer candle on the top row of the black metal rickety stand. Then I stood, gazing. The flame quivered initially but soon grew, boldly licking the air around it. The thought struck me: was I stuck in a weak moment in my life? I felt very insubstantial and hollow. I couldn’t even conjure an intention or prayer as I lit that candle. The lighting in the chapel was dazzling and the prominent statue of Mary loomed above the dozen or so hazel colored, worn wooden pews in front of it. I found an unoccupied spot in the back, kneeled, and let the tears flow unabashedly. As I fervently began to pray the Rosary, using my fingers instead of saying the prayers on the beads, a tranquillity came over me. I felt as though the raging tornado in my heart had been settled. The teardrops ceased and I heard Mary. She said that it was all fine; that she had brought my prayers to God and they were answered. She gave me hope; I believed her and at that moment I knew it was all going to be okay. I felt like someone was breathing peace into my soul. I raised my eyes to the statue of Mary in front of me as my heart fluttered with gratitude. My face was streaked with the remnants of my tears, and what I saw took my breath away. A baby boy, wrapped in a shimmery ivory colored blanket was nestled in the arms of the statue of Mary. I was transfixed. My heart began to drum wildly in my chest. The experience was exhilarating. Mary instructed me to look into the luminous brown eyes of this baby. And then she said, “When he comes to you, you will recognize him by his eyes. And you will feel the blessings of God.” In September 1990 my son was born. I remember gazing into his warm brown eyes and truly knowing that God was blessing my family. Twenty-six years later, in the autumn of 2015, Mary came to me as I sat outside my house in Connecticut in the early evening. I had just returned from Medjugorje (pronounced Meh-jah-gor-ee-ah) a region in Bosnia and Herzegovina known for being the location where Mary appeared to six local children in 1981. These children described Mary as a woman wearing a white gown and a crown with twelve stars on her head and holding a baby in her arms. Mary appeared to the children many times and is still appearing monthly to one of them, Mirjana Dragicevic, who continues to live in Medjugorje. Pilgrims from all over the world still flock to this little rural town to be in the energy of Mary. Now back home, I relaxed on a worn teak chair, my feet snug in my slippers, propped comfortably on the gray stone wall at the edge of the deck, and thought about the trip. I realized that I didn’t feel any closer to Mary than I had prior to the journey. It suddenly dawned on me that I didn’t need to go across the world to find her because she has always been with me. This realization seemed to calm me and bring me peace. The peepers croaked in the woods and, on occasion, there came the sound of a scurrying animal or the shadow of a bird flying from branch to branch. I tilted my head back and looked up at the sky. I was taken with the vastness of it. The stars glittered and I remember feeling so minuscule, so insignificant in the immensity of it all. I felt my heart, a vigorous beat in my chest, as the sky enveloped me. I gazed up at the sky for what seemed like hours but was probably only minutes. Then, I began to feel Mary . . . she floated into my senses and I welcomed her. 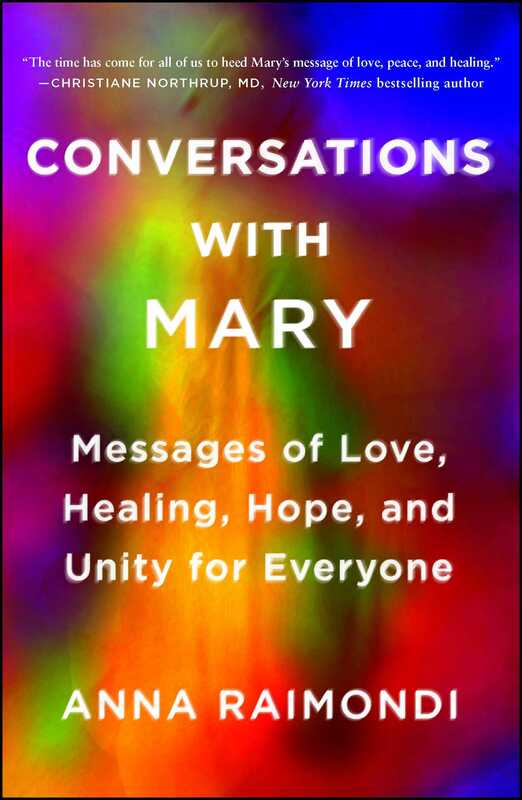 Mary softly, yet emphatically, told me that she was the mother of humanity and she desired to use me as her channel to bring her messages to multitudes of people of all religions, ethnicities, and races. She said the time was upon us to learn how to be closer to God and to find joy and peace in our lives. Although she was gentle, there was an urgency about her. I felt a sensation of panic. Mary calmed my fears and told me that she would speak through me so that the world could be saved. She told me that there would be more and more people who would hear her through me and who would be drawn to the Divine light. Mary assured me that she would bring the right people to me. And so it came to be within a short period of time. Various paths and introductions led me to the vehicle Mary wished to use—this book that you hold in your hands. Two years ago I had not a single thought in my head of writing a book yet shortly after that night I had a book deal with one of the preeminent book publishers in the world. Before long, the first words of this book were being typed onto my computer screen, from Mary through me. This is the way she wanted the world to hear her and I am so honored to be the one she chose to bring her words forward. And I know, without doubt, that this is only the beginning. "A lovely empathic book that makes the Divine Mother more accessible to anyone. The meditations are especially beautiful."